Local creative agency builds a streaming studio for Fortnite's star video gamer. Portland creative agency Roundhouse has designed a new streaming studio for one of the world's top video game players, Tyler Blevins, better known as Ninja. Blevins plays the hit shooter game Fortnite, making an alleged $500,000 a month. He plays all day and much of the evening, streaming live on Amazon's Twitch platform and packaging his best moves for YouTube. He earns his money in subscriptions, ads and donations, as thousands of gamers tune in to his superior game play and PG-13 banter. 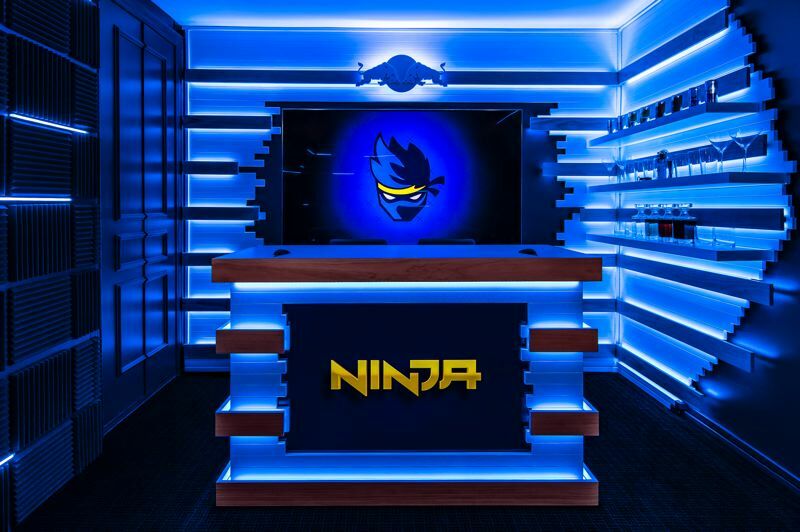 When Ninja's old streaming setup proved too ratty for prime time — 11 million Twitch followers worth — his sponsor, Red Bull, called up Roundhouse to build him something slicker. Roundhouse's new creative director, Robert Medkeff, told the Business Tribune how they went about it. Roundhouse was founded by Dana Bainbridge and Joe Sundby, who met on a snowboard lift and hatched ideas for events and graphics for brands they loved. They have grown to a midsize agency of 80 to 100 staff, working with brands such as Adidas, Reebok, Harley Davidson and Leatherman. "Today, I'd say we're in a higher realm," says Medkeff, who moved here from New York in June. "We're creative problem solvers." For example, Ninja and his wife/manager Jessica don't have kids but they treat their two dogs like family members, Instagramming them and turning to them for comfort between games. The dogs now have a fold-out bench where they can nap. Ninja plays Fortnite on a PC, not a console like PS4 or Xbox, and he kept his modified computer because it didn't need upgrading. However, Roundhouse added four Black Magic 4k video cameras. Roundhouse staff are familiar with designing retail outlets. Ninja's problem was he is on camera 14 hours a day and needed more space, more flexibility and a better overall look. He already has his own logo and video graphics: the cartoon face with the headband and two swords behind his back. TV. He encapsulates the ethos of what an independently-owned creative agency is trying to do, and not do, in a world of advertising. "We work with who we want. We put our personal beliefs and ethics with those brands, and go after what we want. We don't wake up wanting to do Super Bowl ads every day." A team flew to Chicago this summer to visit Ninja in his gated community. They had one hour to interview him about his "pain points, his needs and wants." 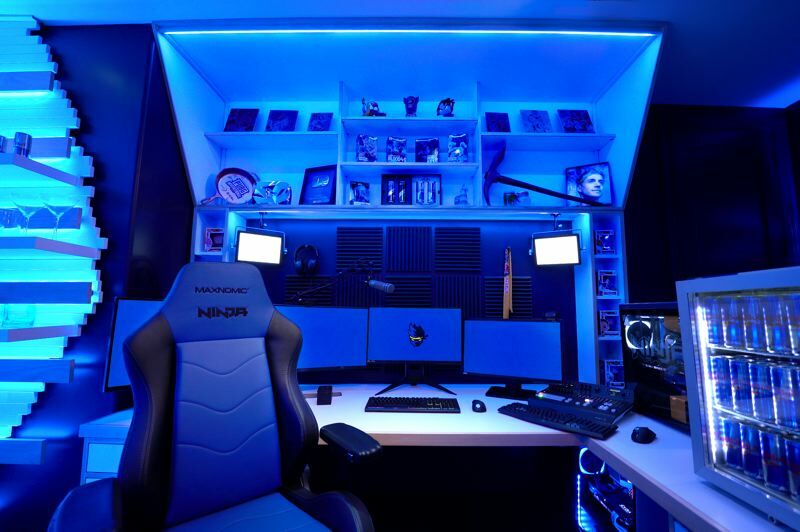 For example, in his old room he had a window that let in too much light and affected his gaming. Ninja wanted more control over the lighting. Now he can change the colors of the recessed lighting from a slider on his control panel. He also has disco lights and music for when he gets up from his chair and does a celebratory dance. He already had someone helping him with his graphics. There is now a wall of monitors behind him so can expand his presence. He gained broadcast quality microphones and proper acoustical paneling and can switch viewing angles with four Black Magic 4k video cameras. The Red Bull logos are deliberately subtle: on his mini fridge and on one wall, and sometimes on a T shirt. His own Ninja logo is prominent. There's also a wall for collectibles and memorabilia that they expect will fill up over time. For most people who watch his game play he's a picture-in-picture talking head. Between games he has to entertain. According to an October cover story in ESPN Magazine, Ninja is acutely aware that he could fall from popularity at any time. A better player could come along, or someone with better banter, or just more celebrity connections. As well as this, he rarely takes a day off because people unsubscribe when he goes quiet. During one two-day trip to a tournament in Los Angeles his subscription base dropped by 15,000. The room went live on Oct. 30 in Ninja's home, which is in a gated community in Chicago. Since his fame really hit this year, he has trouble going out in public without being mobbed and videoed, by kids and adults alike. The room has to be comfortable for long stretches. Roundhouse used a local Chicago contractor to build out the space while Ninja was in San Jose at TwitchCon 2018, a streaming event. Medkeff calls Ninja's studio a stage for 12 million viewers, but it is built for the future. Ninja made his name almost 10 years ago playing Call of Duty, and almost fortuitously switched to Fortnite a year ago when it was barely known. He helped make the game popular, but fashions can change quicker than a makeover. "We wanted it to be something that will grow. Who knows what it will be in five years? It blows my mind how the digital arena we live in changes. He has 12 million followers and he influences the youth." Apparently, there are some "surprises" hidden in the room that Ninja and Red Bull don't want revealed yet. Like the game itself, Ninja's persona and environment needs to stay fresh, similar to an unfolding narrative. Roundhouse recently tricked out a large truck for 10 Barrel Brewing. Another project was for Mophie, the company which makes phone chargers. It was a large, lighted installation at the music festival Camp Flog Gnaw at Dodger Stadium. "We're a collective of creative problem solvers, and building things has always been part of our history. When a client comes in with a problem, we come at it in the craziest way. It's a team effort, it took seven Roundhouse people." Medkeff would not divulge the budget, adding "It's not about the money. Sometimes a small job can be more important than a job that has a lot of money attached to it. We love doing work that keeps us in the culture, making us push the boundaries."